I must be becoming a sloppy reader in my old age. First I completely missed, never remotely suspected, the secret of Chase in Sarah MacLean’s “Rules of Scoundrels” series. And now, I’ve completely missed any hints about Sebastian and Violet’s secret in Courtney Milan’s “Brothers Sinister” series. 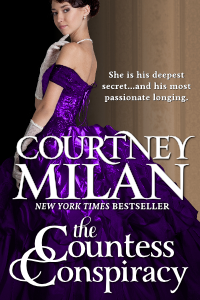 However, the author reveals that secret in the book description for The Countess Conspiracy, so I’m not going to treat it as a spoiler. You have been warned! THE PLOT: At the end of The Heiress Effect, there was a scene where, after a presentation, Sebastian said rather nasty things to Violet in public. I wondered if they had started an affair in which Violet was being emotionally detached. As it turned out, it was almost nothing to do with romantic issues. The truth is: Sebastian’s scientific knowledge was never his, it was always Violet’s. But because Violet is a woman, no one will give her writing the time of day, let alone acknowledge her theories as plausible. So for years, Sebastian has been presenting her findings in his name instead. But now he’s had enough of putting on this show and being abused by an outraged public. He’s trying to prove he could be a responsible guardian to his dying brother’s son, so he tells Violet he’s out. Of course, there’s a lot more to his relationship with his brother than just his brother’s protests over the “inappropriate” presentations. At the same time, Violet has a very interesting relationship with HER mother and sister. When Violet’s father killed himself, her mother taught the girls to never even acknowledge anything that could become scandalous…including emotions. Then there’s the effects of what Violet’s first husband put her through. MY TWO CENTS: These two old friends carry a LOT of baggage. I don’t think there’s any doubt that they love each other, but they have a lot to work through before they can become a couple. Here’s the thing, though: even though it’s a love story, it’s really a story about a woman claiming her identity in every way possible. This book takes place in a time period in which a woman’s “success” was judged by her ability to provide her husband with children. Violet is a highly intelligent woman, and she deserves credit for her work and discoveries. She is also a valid person in her own right without being a baby-making machine. I’m so, so glad that Courtney Milan created a couple where the epilogue wasn’t, “And then, against all odds, they had a baby.” What a rebel thought…that a couple really CAN reach that “happily ever after” without a child, if that’s what they choose. TEACUP RATING: I award this one five teacups, with the caveat that I liked The Heiress Effect better. This is the equivalent of saying I like peanut butter cup pie a little better than French silk pie. They’re both utterly delectable; I just have a slight preference for one over the other!